LENGTH X WIDTH X HEIGHT: 203.8 x 79.6 x 69.9 in. 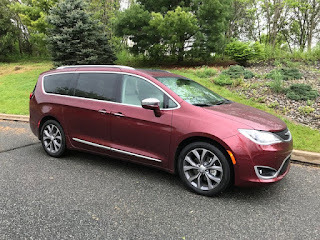 BOTTOM LINE: Chrysler, which invented the minivan way back when, has re-invented the minivan with the Pacifica, that makes the old Town & Country look like a truck. Constant readers of these scribblings will note that the Heilig family is a van family. We owned a full-size van before minivans were invented and drove it for many years as our girls grew from Brownies through college. So while others may prefer sedans or pickup trucks, vans are not summarily rejected here. In fact, two of our daughters own minivans. Our big van was built on a truck chassis (in fact it was a 2500, making it slightly truckier than normal. The ride was rough, but it did the job. Minivans, on the other hand, generally are built on car platforms, and the unibody construction leads to a better ride. Still, I was surprised by how quiet the Chrysler Pacifica is. Very little external noise is transmitted to the cabin, and most of road imperfections are eliminated. To complete the equation, the ride quality is excellent. Under the short hood is a 3.6-liter V6 that is rated at 287 horsepower. This is enough for the Pacifica. I remember that our old (brand name deleted) had trouble climbing the Continental Divide and had to stop for a breather. The only disadvantage to a softer ride came up in our hill climb test. In this, the roads wind and some of the turns are tight. The Pacifica exhibited a tendency to lean in most corners and showed boat-like qualities. On most roads this isn’t a problem, but you should be aware of it if you normally encounter winding roads. Even more than SUVs or CUVs, minivans must have utility, and the Pacifica has utility in spades. For example, interior storage is excellent. It has excellent cargo capacity - for example, there’s a deep well in the rear where the third row stow and go seats go that is useful for most anything you carry, from groceries to garden plants to golf clubs. Here, the Pacifica again outdoes our (BND) that took our family of five on a cross-country tent-camping trip. Doors.There are bottoms to the door pulls that I find useful. There’s a small cubby just beneath the door pull and a dual cubby underneath that with room for water. In addition, there’s a deep cubby at the base of the center console with 12-volt and USB outlets. This cubby also has a curved bottom that helps retain stuff. There’s a large drawer at the base of the center stack with a change holder. Additionally, there’s a slot in the center stack that’s ideal for holding a cell phone. Inside the center console/arm rest is a storage area with a shaped bottom. I’m stressing these small cubbies because on our long trip (and I’m sure, yours) you’re always looking for places to put stuff - snacks, maps, phones, games, etc. Unlike our BND there is no access from the front bucket seats to the rear of the van because of the console. However, the console is more valuable. Front seats are comfortable with fold-down arm rests in the center. Second row seats have assist handles on the B pillars to aid in entry. There’s a pull-up shade on each side window in the second and third rows. My granddaughters love these. Second and third row seats have excellent leg room. Chrysler’s UConnect audio system offers excellent sound quality. There are also two video screens in the headrests of the front seats for second row passengers to enjoy. The girls also noticed that there are pre-loaded games and they were playing checkers within minutes. Overall, the Chrysler Pacifica has shown how far minivans have developed over the years. Personally, I would choose a Pacifica over most of the SUVs, but I am prejudiced. 2018 Jeep Grand Cherokee Track Hawk, supercharged and ready to run!! We don't often think of full size SUV's as performance platforms. But the Jeep Grand Cherokee Track Hawk turns that concept on its head as Bumper2Bumpertv learned. 2019 Hyundai Veloster, a first drive. The second generation of the Hyundai Veloster comes with new looks and new safety technology. Bumper2Bumpertv checked out some of the upgrades on a test drive recently. The big G from Genesis !!! The Genesis brand produces a large luxury sedan that offers many of the same features found in European and Japanese competitors. For the G90 to be a success it will need to match the other entries feature for feature. Bumper2Bumpertv has a look at the platform. LENGTH X WIDTH X HEIGHT: 188.4 x 73.8 x 73.6 in. BOTTOM LINE: The Jeep Wrangler, both “limited” and Unlimited is probably the most unique vehicle on the planet. It has go-anywhere capability, but it is hampered by significant wind and engine noise. A Jeep is a Jeep. It is probably the most unique vehicle around. Okay, the Hummer was unique, too, but they aren’t available any more for civilian use. While other vehicles in the Jeep family try to capture Jeep Wrangler styling cues, you can only do so much. The seven-slot grille traces back to WWII. The square styling has been softened a bit in the JL edition, like with the less vertical windshield, but it’s still one-of-a-kind. Even the plastic fender overiders are legendary. But, there are still round headlamps - not really! There are projection beam headlamps “inside” the round exterior shells. I realize it’s a “Jeep Thing,” but the designers almost go too far. Under the square hood is a 3.6-liter V6 rated at 285 horsepower, connected to an 8-sped automatic transmission. Of course, you can shift into low-low for serious off-road travel. I felt the engine was noisy, but a good portion of the noise could have been wind noise. Because of the Wrangler’s aspect ratio, there is considerable wind noise that intrudes into the cabin. On the plus side, though, there’s enough power to do almost anything. Inside, you almost get the feel that you’re ready for combat, or serious off-roading. There’s even a “chicken bar” handle for the front passenger to hang on. The simple dash is all business. There’s a basic tachometer and speedometer with clear water and fuel gauges. There’s a larger infotainment screen in the center of the dash with Chrysler Corporation’s Uconnect system (a $1,295 option) for navigating it. The center stack has all the HVAC controls, as well as the power window switches, a 12-volt outlet and media connections. Below this are the 4-wheel drive and sway bar controls. Entry and egress is aided by assist handles on the A and B-pillars. For senior citizens, the tall entry (the Wrangler has 9.7 inches ground clearance to get over all those rocks on the Rubicon Trail) can be a challenge and the assist handles are necessary. Our four-door Unlimited tester had a soft top all around. If you can figure out how to work all the snaps, etc., you can convert the Jeep into an all-over convertible. For example, we had issues with the rear because we had to carry a tall can to the local compost center. Then we had a problem getting it back together without significant gaps that would have allowed rain water inside. We still had an interior rain shower when we opened the front door after rain and water poured into the cockpit. Fortunately, our Wrangler had all-weather floor mats (a $130 option) to catch the water. Front seats are firm and not that comfortable for long rides, but they do work for sore backs. There’s good rear seat legroom and an essentially flat floor. There’s also excellent rear headroom and visibility. There are audio speakers in the “roll bar” that protects all the passengers in case of a roll-over (we didn’t check this feature). As a small sport utility, the Wrangler Unlimited has very good cargo capacity. However, I had to lower the rear seat backs in order to get my golf clubs into the rear. The rear head restraints fold when you lower the seat backs. I know it’s a Jeep Thing, and a true aficionado would appreciate the Jeep Wrangler Unlimited a bit more than I did, but I did like the vehicle’s ruggedness and almost willingness to get off-road and do its thing. Toyota thinks there is a strong future for the Corolla. So much so, that the company is putting a lot of money and effort to expand their assembly plant near Tupelo Mississippi. Bumper2Bumpertv has details. 2018 Lincoln Navigator, going big and definitely not staying at home. Bold styling, a robust power plant, luxury appointments, these are some of the traits of the latest version of the Lincoln Navigator. The brand is taking a distinctively American approach as it reclaims its space in the global luxury market, as Bumper2Bumpertv has learned.